SALEM — Just when it seemed the Haunted Happenings carnival was dead, it is returning to the City Council Thursday night — in two different proposals.Police Chief Mary Butler has filed a request putting the carnival at the intersection of Federal and Washington streets downtown. Under the chief’s proposal, the carnival would run on the corner of the intersection that the old Salem Superior Courthouse sits on. A couple of rides would also be set up in the parking lot next to the old District Court building on the other side of Washington Street.At the same time, Ward 2 City Councilor Christine Madore has filed an ordinance change that would allow mechanical rides on the Common “in connection with a City Council permitted event.” She was a noted opponent to a recent plan to hold the full carnival on Salem Common. The language filed by Madore would allow any carnival approved by the City Council — including one similar in scope to the Haunted Happenings carnival. Madore didn’t return a call Tuesday requesting comment. It remains unclear whether her intention is to allow a full-scale carnival with adult rides or to support a smaller operation like the Kids Fun Fest, a Salem Common Neighborhood Association fundraiser which recently removed mechanical rides to comply with city law. Butler’s proposal would use about 17,000 feet for a broader carnival in a congested intersection leading into the northern end of downtown Salem. The attraction used to use about 25,000 square feet of space at the parking lot on 289 Derby St., where it ran for the last 11 years. That lot is now being transformed into a city park. Under the chief’s request, 180 feet of Federal Street in front of the superior courthouse will be shut down and rides would take up the space, extend around the corner and run up the south-bound side of Washington Street, taking up part of one lane of traffic. 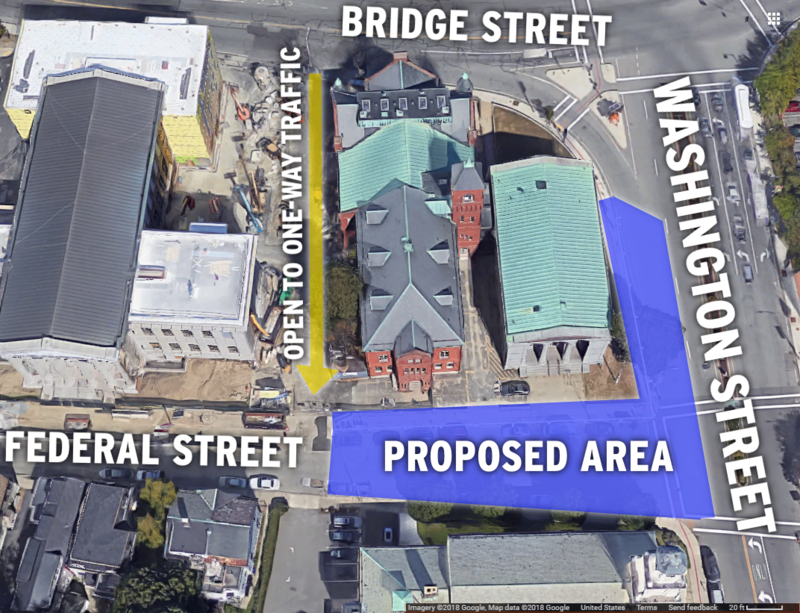 Cars trying to get on the court-lined portion of Federal Street, a one-way road, will take a small side road off of Bridge Street that runs between the superior courthouse and the Essex Probate and Family Court, Butler said. The shutdown would run from Oct. 16 to Nov. 2, with the carnival running from Oct. 19 to 31. The carnival would operate Monday through Thursday from 4 to 9 p.m., Friday from 3 to 10 p.m., Saturday from 11 a.m. to 10 p.m. and Sunday from noon to 10 p.m., according to documents filed ahead of the meeting. On Halloween, it would run from 3 to 10 p.m. The corner previously supported an event stage and beer tent on Halloween night, both of which would relocate to the Common, according to Butler. Both filings come after Mayor Kim Driscoll had given up on the idea of putting the carnival on Salem Common, an activity currently prohibited by city law. Ultimately, she didn’t file the request after determining she didn’t have enough support from city councilors. Madore’s ordinance change, which effectively does what Driscoll’s order would have, calls for “adoption for first passage,” meaning it would not be sent to committee and instead be voted on immediately. Since it is an ordinance change, a second affirming vote would be needed at a future meeting before it could take effect. Councilors could vote on it immediately, as Madore’s request reads, or send it to committee for further review. Many have viewed the carnival as a critical safety piece for Haunted Happenings, for its ability to attract families and concentrate crowds of revelers in a well-lit, heavily surveilled area. But officials haven’t been able to agree on a suitable site for it. At the City Council meeting Sept. 13, Madore said she didn’t oppose the carnival itself, but could not support a plan to hold it on Salem Common due to concerns she’s heard from constituents. She also pushed her colleagues to challenge her opposition. Meetings are held in the City Council’s chambers at City Hall, 93 Washington St., beginning at 7 p.m. Residents looking to speak are encouraged to sign up at the City Clerk’s office on the first floor prior to the meeting.